Durand-Hedden Offers Taste of History at Annual Open Hearth Cooking Demonstration - January 22, 2017 ~ The History Girl! 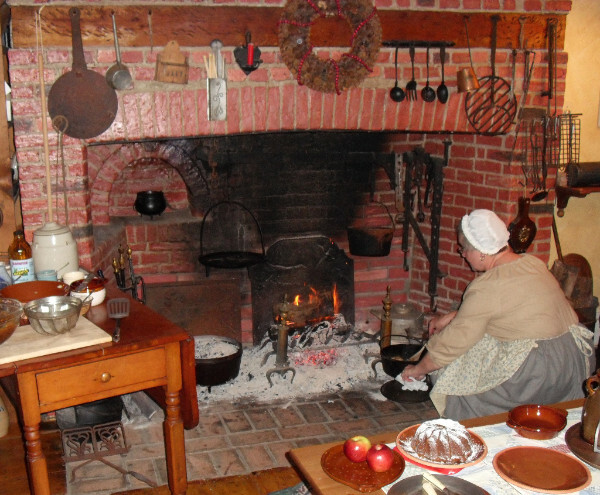 In an annual tradition spanning 35 years, visitors have gathered around Durand-Hedden’s 18th century hearth and experienced how Maplewood residents of long ago cooked, ate, and kept warm during the long winter months. On January 22 from 1:00 - 4:00 pm, Durand-Hedden is pleased to welcome a new cook to its kitchen. Susan Luczu is a New Jersey food historian who has a passion for open hearth cooking that she has practiced at historic sites such as Monmouth County Historical Society’s Covenhoven House as well as the cooking fireplace of her own circa 1705 home in the historic Old Bridge community of East Brunswick. A participant in many culinary organizations and activities, she is webmaster of the Historic Foodways Society of the Delaware Valley and in April 2016 received the NJDAR “Women in American History Award” for her work in preserving, promoting and demonstrating Colonial Domestic Arts and skills in Hearth Cooking. On the menu this year will be vegetable beef soup, apple-cornbread fritters, bubble and squeak, beer batter bread and hearth roasted beets cooked over the fire. Watch how it’s done, breathe in the wonderful aromas in our historic house, and sample a few centuries-old treats. Children can try their hands at old-fashioned cooking chores like kneading dough, churning butter, and watch a spinster make yarn at her wheel. 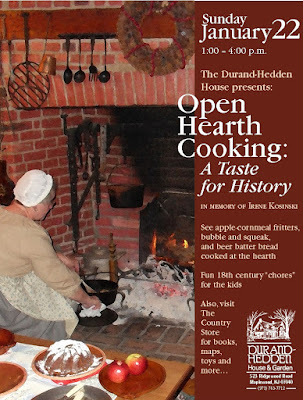 Durand-Hedden’s mid-winter open-hearth cooking demonstration has become an annual tradition to honor late longtime trustee, Irene Kosinski. Irene, a gifted educator and lover of living history, who oversaw the restoration of Durand-Hedden’s beehive oven in 1981. She went on to establish our perpetually popular open-hearth cooking program, which for thirty years has drawn visitors ‘hungry’ for history. Join us on Sunday, January 22, and see why many visitors return for this wonderful tradition year after year. Be sure to also see the fascinating exhibit on the history of the College Hill neighborhood From Farm to Suburb: The Birth of College Hill. which explores the evolution of a section of Maplewood from a dairy farm to a popular neighborhood of 300 houses. Out in the carriage house the Country Store will be selling historic-themed treasures: early American children’s games, books and toys, facsimile documents, quill pens and ink, historic cook books, cookie molds, tin lanterns, reproduction decorative ceramics, vintage photos, hiking sticks and more. You’ll also discover the hard-to-find original Doors of Maplewood poster, Smile, the history of Olympic Park, and the new acid-free reproduction of the charming 1931 map of Maplewood. Durand-Hedden House is dedicated to telling the history of the development of Maplewood, New Jersey and the surrounding area in new and engaging ways. It is located in Grasmere Park at 523 Ridgewood Road in Maplewood, New Jersey. For more information, call 973-763-7712, visit www.durandhedden.org, and visit them on Facebook.